Sharp inhales of breath increase in pace, the distance between them narrowing, until it’s difficult to distinguish between each suffocating pant. Soon a breathless choir manifests, the cloud of noises merging into one. Listening closely, you can pick out different pitches working in sync, enhancing the nauseating panic until the cloud dissipates suddenly… and normal breathing resumes. 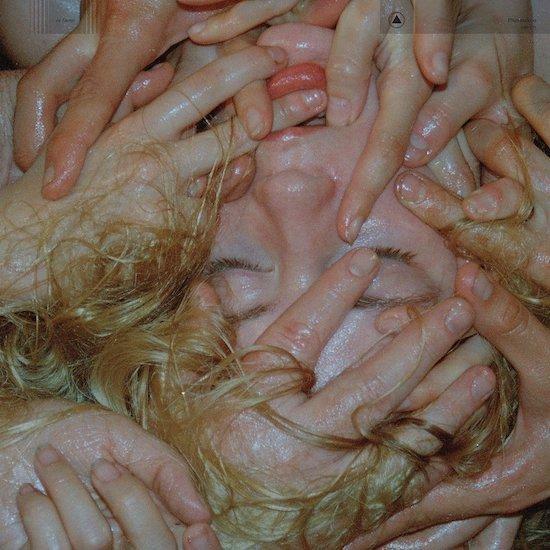 For anyone who has ever experienced a panic attack, ‘Vacuum’, the opening track on Pharmakon’s last album, is a writhing, uncomfortably relatable listen. During that minute and a half, your chest tightens and awareness of your breathing becomes laser focused - recreating that all-too-familiar feeling through the power of sound. Each sonic world that Chardiet creates is intense, emotionally exhausting, and – quite frankly – terrifying. Chardiet’s first two full-lengths, Abandon and Bestial Burden, focused on a rejection of the body, picking it apart and laying it bare through blood curdling screams, power electronics and underlying bursts of noise. Her latest album, Contact, is by no means any different in this respect. However, it changes the focus of the lens and turns it to explore other people’s interactions with that rejection. The artwork depicts several moist hands placed all over Chardiet’s face, loosely grabbing at her closed eyes and slotting in between her lips; there’s an eerie peacefulness to her facial expression as fingers overwhelm her skin and knot themselves through strands of her hair. With Contact, there’s a sense that she’s starting to become more at peace with how our physical form can fail us. The artwork’s depiction of Chardiet’s covered mouth naturally leads to thinking about bodily and intellectual autonomy – and to whom society affords that luxury. The mouth also happens to be the part of the body from where the most striking component of Chardiet’s music emanates: going through one of the most painful ordeals of her life, those screams were something she was trying to stifle. In a sense, this is nothing new – women have often been socialised to be quiet about our pain, to struggle and carry on, even in life-threatening circumstances. And Chardiet’s musical work as Pharmakon is crucial as a counteraction to this: while hearing her scream until the point of exhaustion should be terrifying, it’s more comforting as a female listener; a reminder that women being loud in ways that are deemed “scary” or “intimidating” is both incredibly powerful and important. ‘Nakedness of Need’, the album’s opener, begins with rusty industrial loops before Chardiet’s strained voice mumbles, slowly breaking into full throttle screams. The initial hesitancy inherent in her vocal plays with a more restrained side to the terror unleashed on Abandon and Bestial Burden. Growling noise crawls like car tires stumbling over gravel as she gasps for breath in between screams. The paranoia intensifies as the following track, ‘Sentient’, operates at an uncomfortable low hum. Like an aeroplane picking up speed before taking off from the runway, sounds layering as they heighten in pitch until the sonic ascend makes you dizzy. While not intentionally so, this album and its exploration of the body intersects with a time in which American women like Chardiet are having their bodily autonomy called into question. As the government threatens and plots to limit women’s reproductive health rights by defunding Planned Parenthood, the pained screams of Pharmakon take on a different and timely context. The tense, uncertain atmosphere that threads Contact together becomes a mirror of the fear that many Americans are currently experiencing. The fear that choices are being made about their bodies by people who look nothing like them and have never experienced their pain. Fear also manifests itself in a different way on Contact. Talking to The Quietus recently, Chardiet spoke about having what she called “death attacks,” moments in which mortality feels close, in reach and tangible, rather than a distant conceptual truth. As her voice ripples fiercely through the thundering ‘Transmission’, the low-level panic that descends in those moments ties knots in your stomach; the foreboding sense of tension forces the body into a state of rigidity as distorted walls of noise grumble with trademark dissonance. The album is at its gnarliest on penultimate track ‘Somatic’, which gradually builds without the presence of Chardiet’s voice, encouraging a more of a subtle brand of terror than the waking from a nightmare in the middle of the night during vibe that emanates when her voice is present. Contact, however, does not reside solely in a place of dread and terror. There’s a deeply comforting edge to Chardiet’s sharp, agonising screams – letting each howl grace your ears as you close your eyes and focus on healing inner demons. Noise and industrial music are often thought of as harsh or even shocking genres, often punishing especially in a live environment, but they are also a portal to catharsis – for both artist and audience. As an album, Contact is raw, coming from a place deep within, and that can’t help but rub off on any listener: an invitation to confront your own raw emotions and channel them through the music – and one that cannot be refused. As Pharmakon, Chardiet’s bold approach has earned her a set of dedicated listeners who eagerly, if with some trepidation, await the different twists and turns she takes with her method of making music. Contact is a continuation of the thumping, emotionally wounding sound that has drawn listeners in over the last decade on her first two albums and solidifies, in context, those elements as a sound that is entirely and remarkably her own.